What is a termite? Well, it is an insect, of course. Right? Yes. 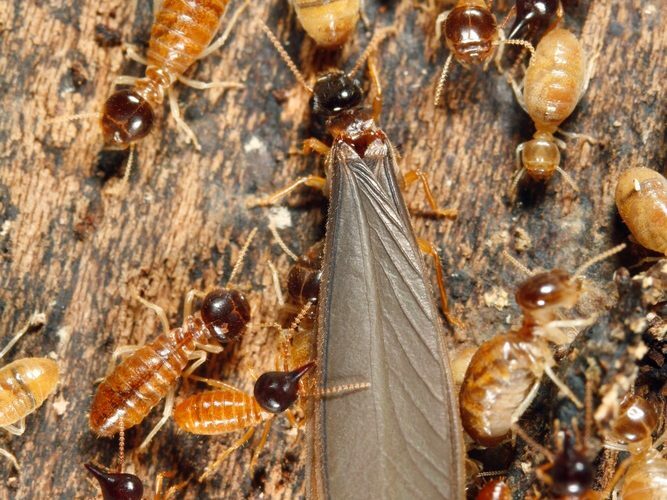 Termites are insects that resemble ants, but are not ants. Although they are tiny, approximately a few millimeters in length, they are detritivores– meaning they eat dead plants and trees which includes wood from trees that your house is made of–and are capable of causing extensive amounts of damage to the foundation of your home, window sills, doorjambs, books, book shelves, furniture, and more. It is always good to know as much about your enemy as possible, and the termite is your enemy. Today you will learn more than you care to know about termites. Termites are born to winged reproductive females and males. Their wings allow them to leave their colonies to procreate and form new colonies of their own. 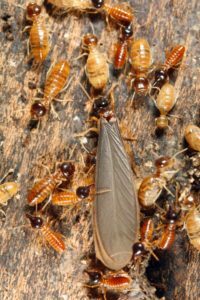 The male and female termite that mated shed their wings and become the queen and king of their colony. Their goal is to reproduce. The queen then lays her eggs from which larvae hatch. These larvae molt several times before they become adult enough to assume one of three roles: a worker, a soldier, or a reproductive termite. Each of these three “castes” have different physical characteristics from the other two. Workers: The workers do the work. They construct tunnels and chambers, and feed and groom the other termite castes. When the queen’s eggs have hatched the nymphs are tended to by the workers during the two-week incubation period, during which they feed them regurgitated food. Workers live one to two years. Soldiers: These termites are yellowish-brown, and have disproportionately large heads and jaws. Soldier termites Their role is to defend the colony from attack. As such they fight, and repair the nest if disturbed. Soldiers live one to two years. Reproductive Termites: The primary reproductive, also called swarmers, are the king and queen that started the colony. The male and female remain together for life (the queen can live 25 years), mate periodically, and can produce thousands of eggs annually. How nymphs are relegated to a certain caste is still a mystery but it is believed that maturity and the overall needs of the colony dictate caste assignment. Research has indicated that castes assignments are not rigidly set, for instance a soldier may become a reproductive termite or a worker if it benefits the needs of the colony. Don’t allow pests take over your home or business, let Carmel Valley Pest Control of San Marcos, CA, inspect your residential or commercial property. Highly qualified and licensed, we can give you advice, set up a regular maintenance schedule (if you so desire), and provide effective treatments to keep your home or business in one piece! And we’re not just pest people, we have over 15 years of experience in interior home and business renovation. Whether you need our pest, termite, or renovation services, our focus is on customer satisfaction. Call us today at (858) 350-8838, (760) 736-8838, or (888) 989-8838. Wow, it’s crazy that a queen termite can live up to 25 years and produce thousands of eggs annually! That would explain why termite control can be so difficult to do if you don’t have professional help. My best friend has an infestation in her home, right now, and she is really in need of a professional to help her get them out. The hardest part of the process is getting to the roof of the problem, and that’s hard to do on your own. As a fellow pest control worker, I found your post very informative about the different jobs that termites have. As much as we hate to find those little bugs in someone’s home, I admit they are interesting little creatures. Just wish they liked to eat something other than dead wood and plants! The more you know about termites will ensure that you’re prepared for when they come after your home. In your article, you stated that although they are tiny, approximately a few millimeters in length, they are detritivores– meaning they eat dead plants and trees which include wood from trees that your house is made of–and are capable of causing extensive amounts of damage to the foundation of your home, window sills, door jambs, books, and book shelves. My wife called me at work this morning because she found a lot of weird marks in the wood in our basement and someone suggested that we had a termite problem. I wonder what tools the professionals use to get rid of termites. It is fascinating that blossoms by your home will pull in vermin into the home. I value your data about the capacity region, my capacity range has a ton of insects. Why are they pulled in to these spots? Much obliged to you for the majority of your accommodating data, ideally I will have the capacity to monitor the bugs this mid year!